I love blogger/brand collaborations and supporting them, especially when they are fabulous like this one. Penny Chic, whom I recently discovered, partnered with Wal-Mart to bring you fashion on a dime. What a more fabulous choice to recreate the Little Black Dress, a staple that should be in everyone's closet. At only $20 per dress, this is both chic and affordable. This is Penny Chic's whole mantra, stylish and affordable. I love it! She knows her stuff too, her videos on her under $10 finds are insane! (That's Penny below - how cute is she?!). On with the challenge. I splurged and bought all 5. I wanted to see how wearable each one of these dresses were for plus sizes. I love the fact that Penny didn't forget about us. She totally offers these dresses up to a 4X. For me, the dress that I would definitely wear is "the curvy." It's flattering and the dress is long enough. Yall know I love a long (below the knee) hemline. "The Curvy" was the only one that provided that. These dresses are definitely for the girls that don't mind showing a little leg. My suggestion is that if you want a little more length go up a size. Note: I bought all the dress in a 3X. "The Utility" fabric was a little different and I felt ran small. Size up on this one. For those wondering my height, I'm 5'9. All are fab, but my top two in design are the skater and the peplum. My one critique is that I wish they had been longer. You can find the whole collection here. I'm not sure if it's available in store, I bought the whole thing online (Wal-Mart has 97 cent shipping). PS. Nobody better not make fun of my photoshopping! LOL! Which is your favorite? Find my bun here, my fishnets here. and fun and colorful skinny belts here. LBD, works like a charm. You look great! You are so cute! I love all of them and actually just saw a lot of them online last night. I just bought some work pieces from the online site. I got three pieces for under $50. So happy! I really like the Skater on you. Fun and flirty. I really dislike supporting Walmart.......................but I'm about to break my strike and go get these ahaha. My mom has been looking to step outside her box and wear some newer styled dresses I think these would be perfect for the both of us! She is shaped like you, i think she deserves to look goregous after losing some weight. The classic and utility are my favorites you make them all look good girl. I DEF understand! LOL! I do think these are worth breaking your vow for, just this time. They are so cheap, yet adorable. Mom is gonna look hot in these! I love the skater... but I love em all... You look fab lady.. 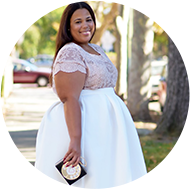 I am totally here for the Curvy, the Utility (love dresses with pockets) and the Classic!! Love all of the dresses on you! Do you find that you can move in them well? I pretty much mean, do they "shimmey" up when you walk. I have that issue a lot with dresses and skirts. The skater, the curvy, and the peplum hold place the best while walking. I looked at this collection and all the dresses looked shorter than I would like as well. How do they compare in fit verses the Target Labworks collection? I like the Labworks fit big to me, this fits a little small. The labworks is also much longer. beautiful dresses but i really like my dresses to be a bit longer just like you! but great selection! I like them all but like you I wish they were longer... when is a company gonna collaborate with you? your start should be shinning way brighter ! I love the peplum ! I want it ! Thank you for highlighting this line. I just purchased the utility and the skater. Never in a million years would I have chosen the skater, but you rocked it so I'm going to give it a whirl. Besides, for $20, if I don't like it I can donate it. Thanks for your good work! You've done it again Chasity! You look perfect in all of them dresses. I really should mention that I like more the Utility, Curvy and the Classic... The curvy is more practical as it helps to cover the arms for people who prefer that. All these dresses looks are simple and fabulous because u chose understated clean pieces of accesories. Love my dresses a bit longer too. You know what, the more I look at you - the more I relate: because you are structured exactly like me. So, watch out coz I'll be stalking this page to learn more from the best ("YOU") how to dress myself and be pretty. Stay blessed and continue to post many more outfits and beauty tips. I have been looking at this dress since it came out. Gotta get the skater! First you look Fabulous and have inspired me to step outside the box and dress my beautiful curvy body. I ordered the Ultility dress last week, it arrived in the mail today and I slipped it on and loved it. The cut, the fabric, THE POCKETS! Cannot wait to add that pop of color w/ jewelry and the skinny belt; thanks for the tip in sizing up, I am bustier and going up 1 size helped. May you continue to have success in all that you do! i LOVE the curvy on you!!! HOT! the skater and peplum worked best for me - your notes on the dress were so spot on! i'm a shorty so i actually like the shorter hemline. it was fun trying them all - you inspired me to get them all and give them a whirl. i thought the classic was going to work the best on me but i was soooo surprised! :) thanks for your review! They all look amazing on you. My favorite is the skater. I may have to get them all myself. You can never have too many LBDs. Can I still order these? ?